U2's Edge, Bon Jovi's Richie Sambora and Kiss's Paul Stanley have added their tributes to the guitar and studio-technology pioneer Les Paul, who died 13 August aged 94. 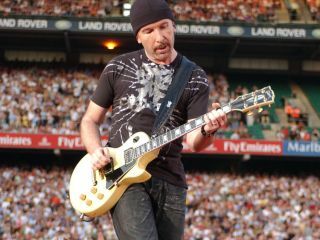 The Edge, in London to play the first of two dates at Wembley Stadium today, called Les Paul, "a legend of the guitar and a true renaissance man". He added: "Les Paul disproves the cliche that you can only be famous for one thing. "His legacy as a musician and inventor will live on and his influence on rock and roll will never be forgotten." Richie Sambora, who was a personal friend of Paul's, said that he was "revolutionary in the music business." "Les lived a very long life and he got to a lot of his goals, so I'm happy for him in that respect. At least he realised that he was a legend in his own time while he was alive." Kiss's Paul Stanley added: "The name Les Paul is iconic and is known by aspiring and virtuoso guitar players worldwide," Stanley told the Associated Press. "That guitar is the cornerstone of a lot of great music that has been made in the last 50 years." John Mayer tweeted: "Remembering Les Paul today. Just happened to have his namesake Gibson around my shoulder the last few days. Pictures of Les Paul all over the studio today. Very special day in here. You should wiki his life. Pretty amazing." Tom Morello said: "RIP Les Paul- thank you for the instruments that changed the course of music. If u have ever 'rocked' or 'been rocked' u can thank Les Paul." Joan Jett added: "I and everyone at Blackheart Records mourn the passing of our dear friend, Les Paul. "Without the advances he pioneered, the recording sciences and the electric guitar would have been left years behind."